The end of April saw the UIP thwart two notable criminal incidents on the road. While these efforts are commendable the UIP is concerned about criminal attempts like these and is working with security companies and community structures to try and find solutions. 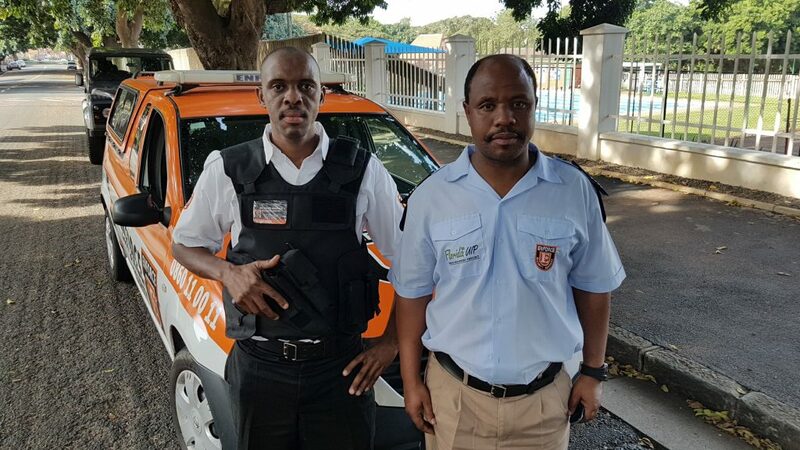 On Monday 1st May, UIP security officer Eric Maphumulo and Enforce armed reaction officer Richard Mbatha (pictured above) were notified off a suspect walking along Florida Rd that was involved in a pick-pocketing incident a couple nights before. Both officers responded and apprehend the suspect, who was then positively identified by the victim. SAPS were contacted and the suspect arrested. On the weekend of the 30th April there was an attempted hijacking on the corner of 10th Ave and Montpelier Rd. When 3 suspects attempted to overpower an individual returning to his vehicle, Sidewalk Monitors Harry and Lorraine ran to the scene disturbing the suspects – going above and beyond the call of duty. A huge thanks to all those dedicated to protecting Florida Rd.